The long-awaited dose of reality from the massive and unprecedented financialization of the global economy has finally begun. Of course, those of us who understood from the start how healthy economies and markets naturally function, knew that a viable recovery from the fiscal and monetary excesses--which caused the great recession and financial crisis of 2008--was never underway. This is because central banks manipulated interest rates to zero percent and below and kept them at that level for a decade. Then, those same low rates engendered a humongous amount of new debt to be incurred, leading to the rebuilding of the current stock and real estate bubbles. And, it also created a tremendous and unprecedented bubble in the global fixed income market. This entire artificial construct, which was built upon bigger asset bubbles and greater debt loads, is now being tenuously held together by that very same government-engineered bond bubble. However, the bond bubble is now bursting. Global central bankers now face the results of their $14 trillion worth of money printing since 2008, which was manufactured in search of fatuous inflation targets. This “successful” achievement of inflation goals is now being met with the removal of that liquidity, as asset price levels have become completely unstable. Indeed, this switch to a hawkish monetary policy is now being adopted by many of the world’s central banks. There have been a total of 13 countries that have hiked interest rates so far this year, and only 5 rate cuts. According to Capital Economics, among the 20 major global central banks, they cover, just one (China) will cut rates in the remainder of this year. Whereas, the U.S., Canada, Norway, Sweden, Brazil, India, and South Korea are all expected to hike before year’s end. Not only is the next rate decision expected to be Hawkish in 14 out of the 20 nations—with Japan expected to be neutral for the foreseeable future--but the pace of monthly Quantitative Easing is projected to drop to zero by the end of 2018, from $180 billion at its peak in March of last year. This incorporates the Fed’s selling $600 billion off its balance sheet per year starting in October. These central banks are being forced into a tightening monetary policy due to rising consumer prices and asset bubbles that have become a major risk to economic stability. Otherwise, these countries risk intractable inflation and a destructive rise in long-term interest rates. 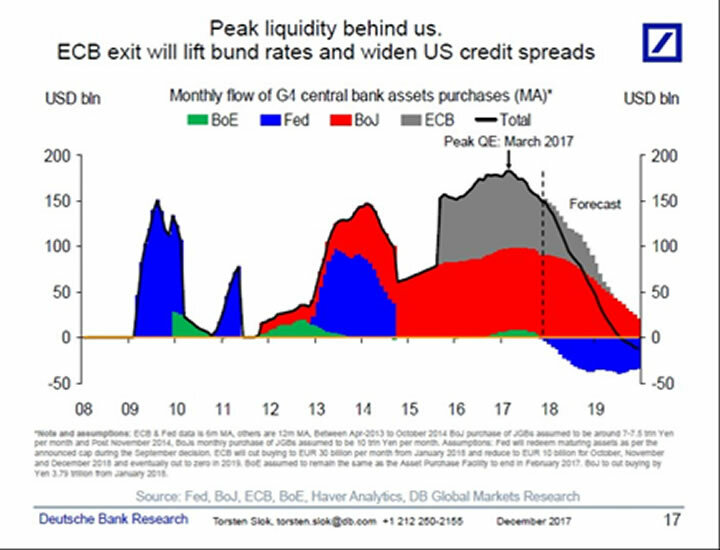 Leading to this potential chaos in fixed income is the massive spike in global debt levels. Thanks to the free-money policy from central banks, debt has increased by $70 trillion since 2007, to reach $250 trillion--an increase of over 40%! Not only has the nominal level of debt soared but the leverage ratio is up too. Today, the worldwide economy suffers a debt to GDP ratio of 320%; it was 270% leading up to the financial crisis. 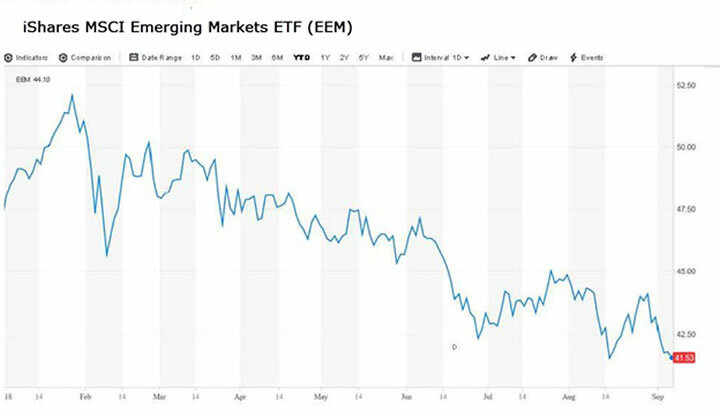 Nevertheless, the change in global monetary policies is already adversely affecting emerging markets (EM), commodity prices, and the real estate market here in the US. The EM space is highly sensitive to interest changes in the U.S. because these countries have borrowed massively in dollars and rely on quiescence in currency exchange rates to be able to service their foreign debt. The prospect of EM defaults has sent these markets crashing 21% from their highs earlier this year. Leading the bear market in the EM space is the collapse of Chinese shares. The Shanghai Stock market has entered into a brutal bear market because the Sino-scam government has reached the end of its rope; and can no longer generate growth by issuing new debt. Chinese shares are down 19% YTD and have plunged 25% since the January high. 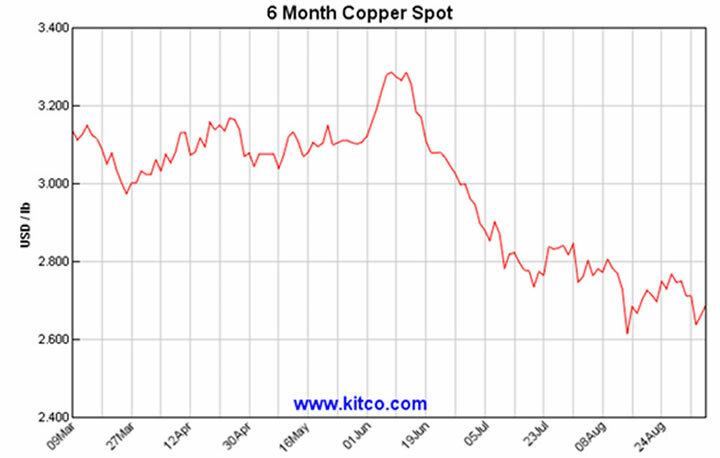 Dr. Copper, known as the commodity with a Ph.D. in economics because of its sensitivity to economic growth, has dropped 20% in the past three months as well. 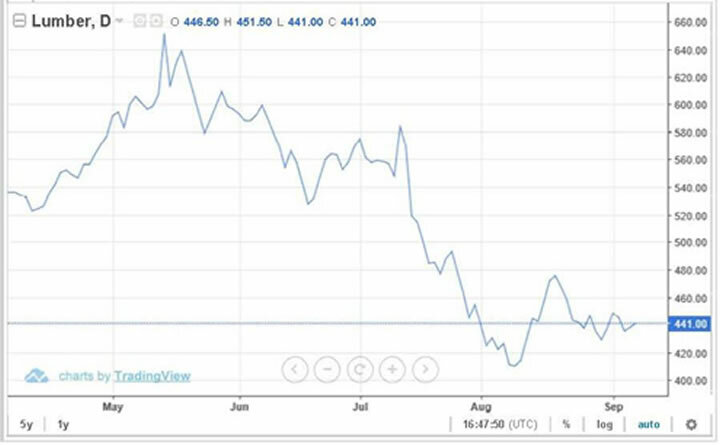 One has to also wonder about the validity of the globally synchronized recovery and strong consumer mantras coming from Wall Street shills; while the lumber price has tumbled 40% since its May high. The Fed’s reverse QE program, along with its seven rate hikes from December 2015 thru June 2018—with two more slated for this year--is also putting pressure on the most interest rate sensitive parts of the U.S. economy. For example, the housing market is cooling. The largest part of the real estate market (Existing Home Sales) has dropped 4 months in a row and are down 1.5% year-on-year. In addition, Pending Home Sales have suffered losses 7 months in a row and slumped 2.3% YoY. The truth is as long as the bond bubble kept inflating it was able to mask the huge imbalances built up in debt and asset values. However, we have finally reached the point, after a decade of this market-destructive experiment, where the bond bubble is bursting. Central banks will continue to tighten rates on the short-end of the yield curve until inflation is choked off, which will crush asset prices and GDP growth. Or, long-term interest rates are going to rise intractably if central banks were to now stop raising rates and let inflation run wild. In either case, the bond bubble is bursting and will continue to do so. Printing money covers up a lot of problems in the short-term. But in the long-run, the process of massively diluting currencies in order to force down interest rates towards the zero percent level and below, greatly exacerbates the problems that governments were trying to ameliorate in the first place. In other words, asset prices have become even more distorted, and debt levels have grown to a greater destabilized level than ever before. Inflation and debt can’t be the cure for a crisis caused by too much inflation and debt. But thankfully, this principle will no longer have to be explained; as the empirical evidence of the next financial crisis has already begun. We can only hope that in its aftermath, this lesson will finally be learned.